"This is a quick and easy salad to prepare and it's a healthy meal when served with chicken or fruit." 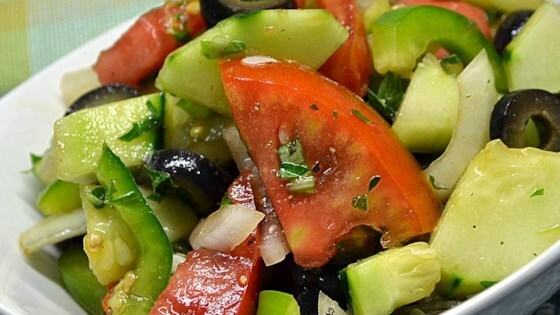 In a large bowl, combine the red bell pepper, green bell pepper, cucumber, tomato, red onion, and olives. Whisk together the oil and vinegar. Before serving add the oil and vinegar, feta cheese and salt. Toss together and serve. Summer vegetables dressed in a tangy, refreshing vinaigrette. Thank you very good and tasty. Great! I used olive oil and balsamic vinegar. Hit the spot in the middle of winter! Happy I found this recipe. It was HUGE and hardly any was left. Yummy. And I'm not always a fan of salads.